Looking for a way to skin your knuckles fixing things that shouldn't have broken, in between brief periods of motoring terror as you try to dodge Suburbans and semi trucks while getting windburn and sunburn simultaneously? Don't want to look like a hairdresser or secretary while doing so? 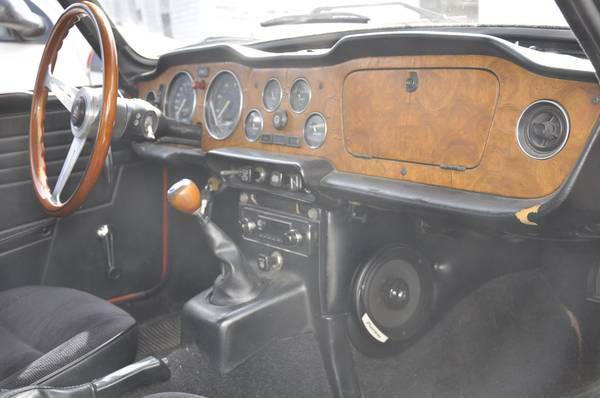 Then you need a Triumph TR6! Triumph is a brand that doesn't get much press anymore - and for good reason - they have been extinct since the early 1980s. However their last "normal" looking roadster, the TR6, is still relatively common in the US. 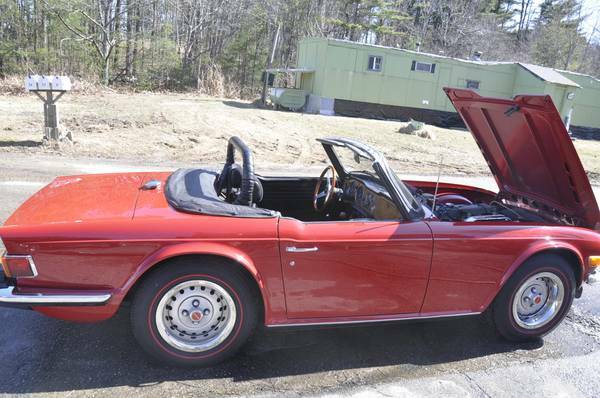 If you're feeling a bit masochistic but are tired of cutting yourself with safety pins, check out this 1973 Triumph TR6 for sale in Woolwich, ME for $10,000 via craigslist. Tip from Keenan D.
The TR6 was created in Britain's dark and dreary ages of auto production, when Triumph was owned by the megalomaniacal British Leyland Corporation. BL swallowed up most of the stubborn old marques remaining in the UK and proceeded to badge engineer the personality out of their remaining unique vehicle lineups. At one point BL owned Alvis, Austin, Austin-Healey, BSA, Daimler, Jaguar, Land Rover, Lanchester, Mini, Morris, MG, Riley, Rover, Triumph, Vanden Plas and Wolseley. British Leyland attempted to "out-GM" GM, and in fact did so by becoming bankrupt and folding in 1986. I'm getting deja vu over here...must have been something I ate for lunch...(see this posting from July 2012 for an explanation).